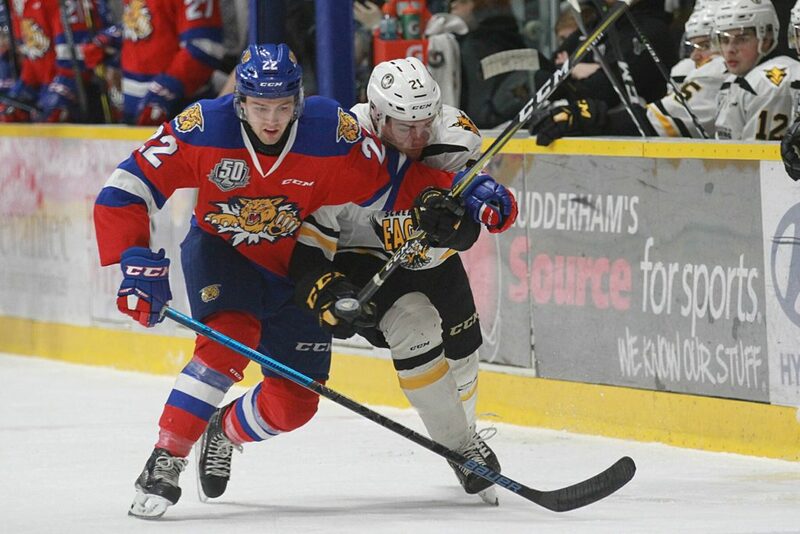 After a pair of visits from Quebec based teams, it’s back to Maritime rivalries tonight as the Screaming Eagles play host to the Moncton Wildcats. It’s the fourth contest in a five game home stand for the Eagles, against a team which they’ve had plenty of close games against this season: the last five meetings have been decided by one goal. Coming into tonight’s encounter the Eagles are fourth in the Eastern Conference with a record of 31-15-5, and a home record of 16-7-3. The Eagles hold a game in hand on third place Rimouski, who lead Cape Breton by six points and visit Shawinigan tonight. Fifth place Charlottetown holds a game in hand on Cape Breton, trails the Eagles by four points and will host Drummondville this evening. Moncton finds themselves in a tie for sixth place in the East with Chicoutimi. The Wildcats have a record of 26-18-7, and are 13-7-4 on the road. Moncton is looking to break a six game losing streak. The Eagles have also dropped two straight, although the Eagles picked up a point in each loss with both games going to a shootout. This season the Eagles have won four of six games against the Wildcats- with two wins and one loss at both Centre 200 and the Avenir Centre. The Eagles two home victories have both come in a shootout. Mitchell Balmas comes into the game on a hot run, scoring goals in four consecutive games. The Eagles are also hoping their power play is heating up as well, as a previously struggling man advantage has produced a goal in the last three games. Moncton’s defense core will be tested tonight with a pair of three game suspensions to 19 year old defensemen Aleksi Anttalainen and Jonathan Aspirot. The Wildcats may have to try to win games with offense, holding two of the league’s top ten scorers- Jeremy McKenna (75 points in 51 games) and Jakob Pelletier (66 points in 48 games). This evening’s game goes at 7 PM. Tickets can be purchased at the Centre 200 box office, by phone at 902-564-2200 or online at https://tickets.capebreton.ca/Online/default.asp Go Eagles Go!